Moldova’s president eagerly welcomed the forum, making Chisinau the third former-communist capital in three years to host the conservative talk shop. Attendees at the Palace of the Republic in central Chisinau on September 14 and 15 included government officials from Russia, Christian scholars from the United States, and a smattering of illiberal figures from Europe to Africa to Latin America. With a full orchestra accompanying choreographed dance routines and video homages to families and babies, the World Congress of Families (WCF) was not lacking in pomp. But observers say the organization – designated by the Southern Poverty Law Center, a civil rights watchdog, as a hate group – is unlikely to upend liberal values anytime soon. The WCF began in the mid-1990s as a collaboration between U.S. historian and religious scholar Allan Carlson – coauthor of “The Natural Family: A Manifesto” – and Russian sociologists Anatoly Antonov and Viktor Medkov. A visit to Moscow by Carlson in 1995 sparked the idea to contrast social policies in Western states to those in countries emerging from communism. Two years later the WCF kicked off in Prague with about 700 participants. Since then, it has been held in numerous locations – like Geneva, Mexico City, Warsaw, Amsterdam, Madrid, and Sydney – and grown to attract several thousand attendees every year. Many of those open arms are Russian. Early on the first day, Duma member Svetlana Zhurova reminded attendees that Russian President Vladimir “Putin supports family values.” Federation Council Senator Yelena Mizulina, who introduced Russian legislation banning adoption by LGBT parents and the notorious “gay propaganda” law, implored attendees: “Don’t be afraid of making propaganda for the family.” Dozens of other Russian officials attended, including Dmitry Smirnoff, an envoy from Russian Orthodox Patriarch Kirill. Media reports often link the WCF to Kremlin-friendly oligarchs. Nevertheless, Moldova is on the frontline of the culture wars between Russia and the West. This year’s conference was headlined by Moldovan President Igor Dodon, the Socialist Party’s pro-Russian leader. Dodon has frequently butted heads with the pro-EU ruling coalition in parliament while trying to bring his country closer to Russia. 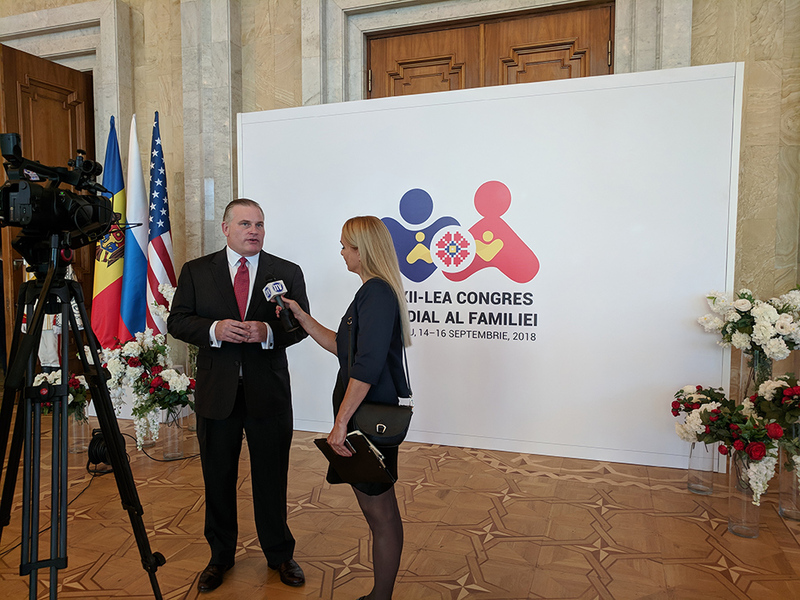 At the WCF, Dodon evoked family as the solution to many of Moldova’s woes – emigration, population decline, economic stagnation – and called for “festivals of sexual minorities,” a reference to LGBT-pride events, to be outlawed. Some in Moldova’s chattering classes regard the timing of the WCF as a powerplay. Ahead of parliamentary elections in February, Dodon is seeking to consolidate the Socialist Party’s position at the expense of the pro-EU coalition. The Socialists are currently leading in the polls, and the WCF could help solidify the party’s support among an overwhelmingly Orthodox electorate. Moldovan church leaders threw their support behind the WCF during the opening ceremonies. “The [head of the Moldovan Orthodox] church is under the patronage of the Russian [Orthodox Church] and under the influence of pro-Eastern political parties,” said Victoria Bucataru of the Foreign Policy Association of Moldova, a think tank. But beyond the broad “pro-family” message – and a chance to attack the “invasion of radical liberalism,” as one Georgian speaker enthused – there was little obviously uniting assorted participants. The WCF felt little more than a talk shop, a venue for conservative groups from around the world to exchange ideas and develop relationships. Though the number of participants has grown and the geographic distribution has broadened since its early years, the WCF is unlikely to become a worldwide movement that drives concrete change, said Melissa Hooper of Human Rights First, an American campaigner. Russia may use the organization “to drive dissent and drive confusion, pit groups against each other,” but the WCF will “continue to be a small, nagging organization that gains small victories in countries where governments are supportive, like Poland or Russia or Hungary,” Hooper said. Even that modest goal looks ambitious in Moldova. Aside from Dodon and some notable Russian officials, prominent figures gave the WCF a miss. And the next congress will be held in Italy, shifting the focus back to the West.